For the past few years, the Coleman Heritage Center in Gurteen, Sligo, has been busy producing collections of archival recordings. 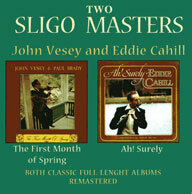 This one, the newest, is a little unusual as, instead of consisting of a collection of mostly private recordings by different musicians and from different time periods, it is a re-release of two commercial LPs produced in the late 1970s by the US label Shanachie, John Vesey's "The First Month of Spring," and Eddie Cahill's "Ah! Surely." Although it would have been nice to hear those two master musicians play together, these were solo LPs, with guitar accompaniment, and the producers of the new release made a point of keeping them separate by making this a 2-CD set. For those who never had a chance to get those classic recordings when they were first out, here's a great opportunity to hear them, with their plusses and minuses--Brady's guitar playing, good technically otherwise, sounds rather odd juxtaposed to Vesey's playing, and Moloney's tends to drag things down on the Cahill album. But this is how it was done then and, a bit like one who listens to 78s must often mentally filter out bad piano accompaniments, this is not reason enough to ignore two great documents of the "Sligo style."